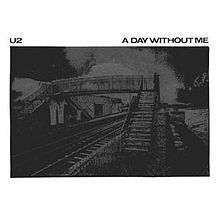 (1980) "A Day Without Me"
(6) "A Day Without Me"
(7) "Another Time, Another Place"
"A Day Without Me" is the lead single from U2's debut album, Boy. Released in August 1980, it was the second single the band recorded after signing the contract with Island Records. The single release was produced by Steve Lillywhite, and was the first time that he recorded with U2. The B-side is an instrumental song called "Things to Make and Do." "A Day Without Me" was played live during the first half of the 1980s. On the Boy Tour, it did not have a firmly defined set list position, initially appearing in the main set before moving to the encore. It did not appear on the October Tour until November 1981 (1981-11), when it was paired with "I Threw a Brick Through a Window," a song from the newly released October album. The two songs were linked by a drum segue leading from the end of "I Threw A Brick Through A Window" into "A Day Without Me," and this pairing lasted until April 1985 (1985-04). Since then, neither song has been played live, although "A Day Without Me" has been snippeted on rare occasions. A live performance of the song from Red Rocks Amphitheatre appears on the concert film U2 Live at Red Rocks: Under a Blood Red Sky. "Things to Make and Do" was the only instrumental ever played live by U2 until the U2 360° Tour ("Return of the Stingray Guitar"), and it regularly followed "The Electric Co." on the Boy Tour. It has only been played once since the end of that tour, at an early date of the October Tour on 31 August 1981 (1981-08-31). ↑ The bridge in the photograph at the time of its release was mistaken in England as being located in Manchester as it looked similar to one that had been used in the advertising photo images for the English band Joy Division, taken by photographer Kevin Cummins in January 1979. ↑ Sams, Aaron; Kantas, Harry. "U2 – "A Day Without Me" Single". U2songs.com. Retrieved 22 April 2016. ↑ 'It was the Summer of '79, when the Heat was felt by McGuiness', by Declan Lynch. 'Irish Independent' 29 October 2006. ↑ Mühlbradt, Matthias; Axver, André. "A Day Without Me". U2Gigs.com. Retrieved 2009-08-17.